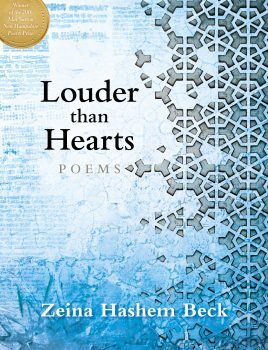 ‘Louder than Hearts has it all’, writes Betsy Sholl, judge of the 2016 May Sarton New Hampshire Poetry Prize, ‘compelling language and a sense of moral gravitas […] the ability to address a larger world with passion and artfulness’. High praise, though not at all mistaken in describing Lebanese poet Zeina Hashem Beck’s second collection, which brings together new and selected poems from her earlier chapbook 3arabi Song: also a winner of the 2016 Rattle Chapbook Prize. Interspersing longer, narrative sequences (‘Naming Things’, ‘Khandaq Mon Amour’) with formal experiments on shape poems, text messages, ghazals, and even mathematical equations, Louder than Hearts is a brilliant, daring addition to a growing corpus of work that celebrates our shared present while bearing witness to shared pain. his palms like food, like forgiving the dead. their voices, this believing, the dead. Death is held close, personalized: violence does not allow Beck’s narrators the luxury of abstraction. But not all tragedies occur with the same suddenness or force. Beck pays equal attention to the quieter calamities of sickness and age, and narrates in one of the collection’s longer poems (‘3amto’) the gradual processes of losing a loved one. ‘The gallstones are bright, / almost beautiful, almost good for a necklace’, she writes (the repeated ‘almost’ gesturing insistently to something unfulfilled), ‘come visit me more often, not just / when I’m sick’. Although this loss takes place more slowly than in the tragic events of the earlier poems, it is not without some of the same hurt and confusion, wrought in this case by distance rather than disaster: ‘what was that you said? / sorry / the line isn’t good / yes it’s very late’. Across continents, ‘bullets or no bullets’, time and technology wreak a violence of their own. As Beck has written elsewhere, though, ‘sorrow is not all that we are’ – and there is, in these marvellous pages, ‘something that celebrates, too’. Some of the most moving anthems are found in Ahwak, but in truth the collection’s two latter segments fit together like a couplet of sorts: surprise followed by stability, praise and then prayer. Grounded, as always, in detailed observation, Beck records and hymns the ordinary gifts of physicality, motherhood, and living between two languages; a way of walking us through her world: ‘This way, / I showed you, my arm like a small bridge, / this place…’ (‘My Non-Arabic Lover and I Take the Train’). Old and new, broken and whole, the figures of the city and the woman switch places in her deft lines, holding within each poem an invitation (‘In the garden of our language, a beggar / is he who waits to reap a kiss / at my door’) and a song (‘In the currency of love, her teeth / are pearls’ – ‘Qudud Variations’). To the reader, arriving at these truths after the emotional assault of the book’s opening sections, they seem infinitely more precious. But of course they, and their poet(s), have been with us for centuries: ‘the woman in me is thousands / of years old,’ writes Beck in the title poem, ‘her voice louder / than hearts and derbakkehs’.